University of Iowa Libraries, Special Collections Dept. Come check out the 2015 Nancy Drew Iowa Convention, celebrating the 85th anniversary of Nancy Drew and the 110th anniversary of Iowa native and Nancy Drew author, Mildred Wirt Benson! University of Iowa Main Library, Room 2032. 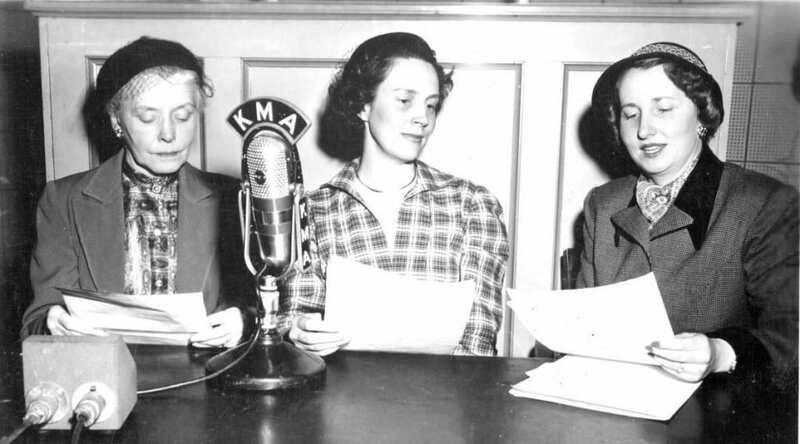 You can read about this event in the Iowa-City Press Citizen, and come learn even more about the life and work of Mildred Benson by exploring her papers at the Iowa Women’s Archives. This post, by Christina Jensen, appeared on the Iowa Women’s Archives Tumblr this summer, and has since been featured on NBC news. On June 28th, 1914, Austro-Hungarian Archduke Franz Ferdinand was assassinated in Sarajevo by Yugoslav nationalist Gavrilo Princip. One month later, war broke out across Europe between two alliance systems. Britain, France, Russia, and Italy comprised the Allied powers. Germany, Austria-Hungary, and the Ottoman Empire constituted the Central powers. As war raged abroad, the U.S. wrestled with the politics of neutrality and intervention. In April of 1917, President Wilson was granted a declaration of war by Congress. The United States thus officially entered the conflict alongside Allied forces. To mark the occasion of the World War I centennial, we’re remembering Iowa women whose lives were shaped by the war. 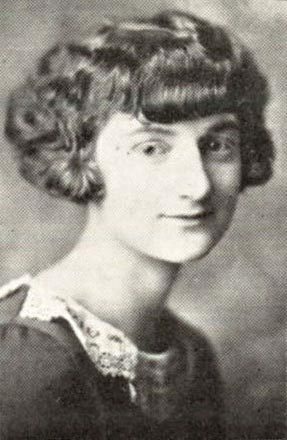 One such woman was Clayton-native Louise Marie Liers (1887-1983), an obstetrics nurse who enrolled in the Red Cross and served in France as an Army nurse. Before her deployment, however, Liers was required by the American Red Cross to submit three letters “vouching for her loyalty as an American citizen.” All nurses, regardless of nationality, were similarly required to provide three non-familial references testifying to this effect. While questions of loyalty and subversion are exacerbated in any war, America’s domestic front was rife with tension driven by geography, class, and ethnicity that raised fears and stoked national debate in the years leading up to America’s engagement in the Great War. 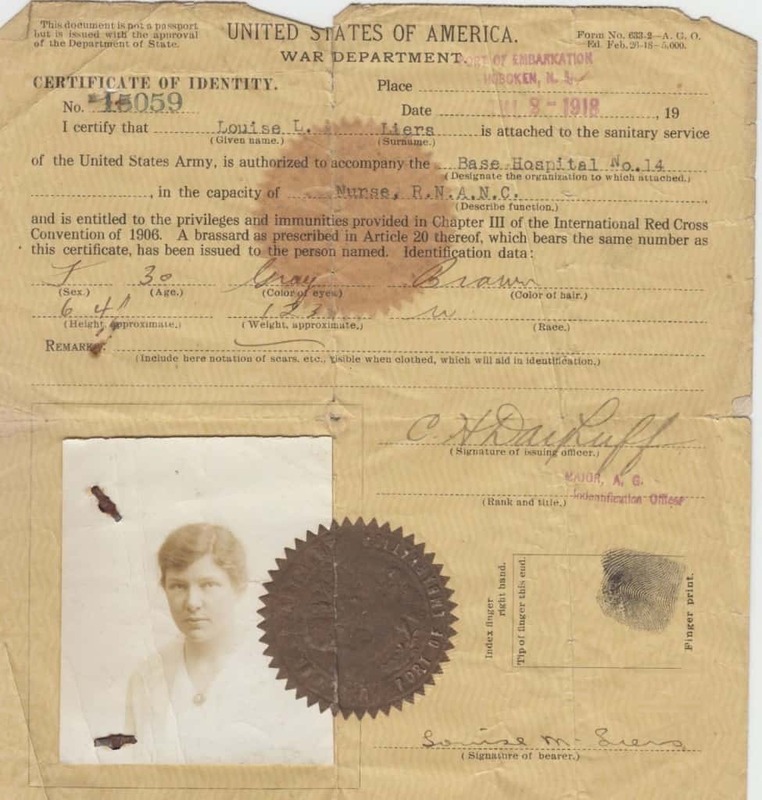 Louise Liers’s war identification. 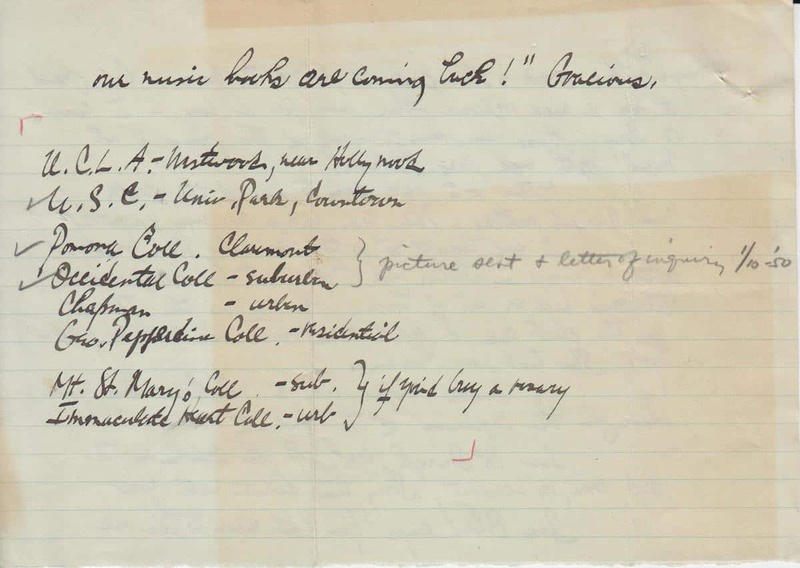 Louise Liers Papers, Iowa Women’s Archives, The University of Iowa Libraries, Iowa City. 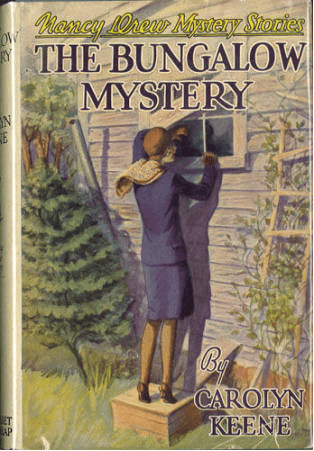 Arriving in 1918, Liers was stationed in the French town of Nevers where she treated wounded soldiers. During this time Liers wrote numerous letters home to her parents and brother describing her duties and conditions of life during the war. In a letter to her brother, featured below, Liers described her journey to France from New York City, with stops in Liverpool and Southampton. 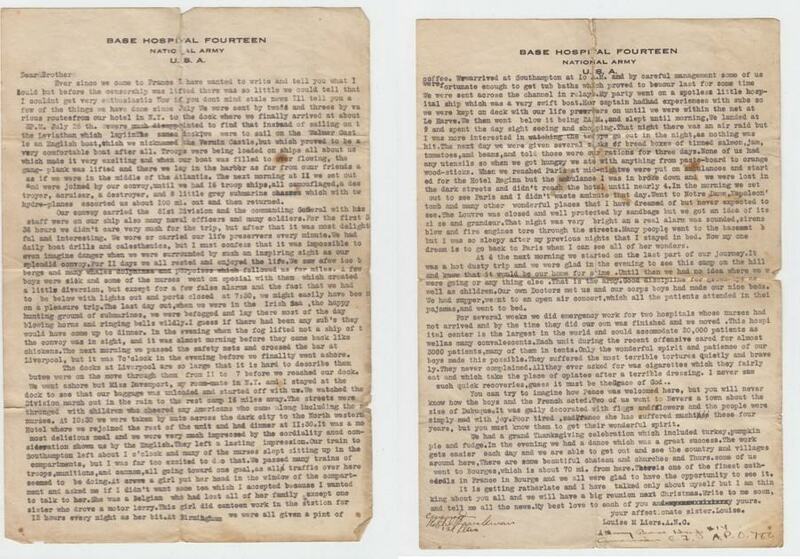 Louise Liers’s letter to her brother, describing her journey from Iowa to Base Hospital No. 14 in France. Louise Liers papers, Iowa Women’s Archives, The University of Iowa Libraries, Iowa City. When Liers arrived in 1918, Nevers was only a few hours away from the Allied offensive line of the Western Front. She was assigned to a camp that served patients with serious injuries and those who required long-term care. Liers noted in a 1970 interview that, by the end of the war, as fewer patients with battle wounds arrived, her camp began to see patients with the “Asian flu,” also known as the 1918 influenza outbreak that infected 500 million people across the world by the end of the war. In letters home, and in interviews given later, Liers described pleasant memories from her time in service, including pooling sugar rations with fellow nurses to make fudge for patients. Nurses could apply for passes to leave camp and Liers was thus able to visit both Paris and Cannes. In an interview Liers recalled that, serendipitously, she had requested in advance a leave-pass to travel into town for the 11th of November, 1918. To her surprise, that date turned out to be Armistice Day, and she was able to celebrate the end of the war with the citizens of Nevers. Along with her cheerier memories, however, Liers’s papers also describe the difficulties of caregiving during war. She described Nevers as a town “stripped of younger people” due to the great number of deaths accrued in the four years of war. In later interviews Liers offered many accounts of the grim surroundings medical staff worked under, from cramped and poorly equipped conditions, to unhygienic supplies, such as bandages washed by locals in nearby rivers, which she remembered as “utterly ridiculous from a sanitary standpoint…they were these awful dressings. They weren’t even sterilized, there wasn’t time.” Due to the harsh conditions and limited resources, nurses and doctors gained practical knowledge in the field. Liers recalled frustrating battles to treat maggot-infected wounds before the nurses realized that the maggots, in fact, were sometimes the best option to keep wounds clean from infection in a field hospital. By the time the “final drive” was in motion, Base Hospital No. 14 was filled with patients to nearly double capacity, and doctors and nurses had to work by candlelight or single light bulb. Liers’ wartime service and reflections suggest a range of emotions and experiences had by women thrust into a brutal war, remembered for its different methods of warfare, inventive machinery, and attacks on civilian populations. 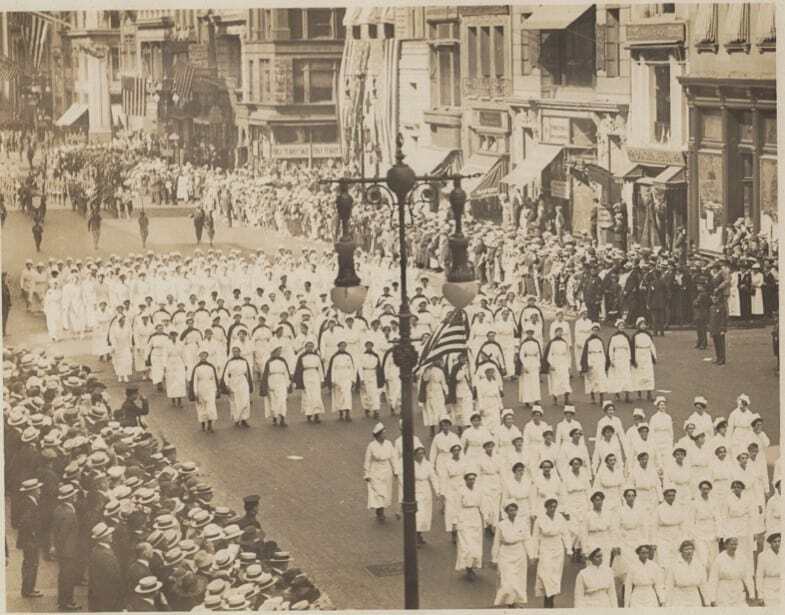 Army nurses on parade, c. 1918. 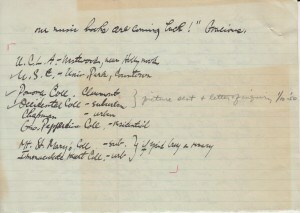 Louise Liers papers, Iowa Women’s Archives, The University of Iowa Libraries, Iowa City. Liers worked in France until 1920, and her correspondence with friends and family marks the change in routine brought on by the end of the war. With more freedom to travel, Liers and friends toured throughout France, and like countless visitors before and after, Liers describes how enchanted she became with the country, from the excitement of Paris to the rural beauty of Provence. Following the war, Liers returned to private practice in Chicago, and later Elkader, where she was regarded as a local institution unto herself, attending over 7,000 births by 1949. She was beloved by her local community, which gifted her a new car in 1950 as a sign of gratitude upon her retirement. A list of collections related to Iowa women and war can be found here. 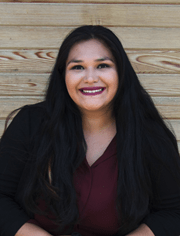 This post was written by Jessica Lawson, Graduate Research Assistant in the Iowa Women’s Archives. (Clockwise from left) Sondra Smith, Barb Yates, Dale McCormick, Gayle Sand, and Francie Hornstein. The Iowa Women’s Archives had an exciting visit at the end of July! 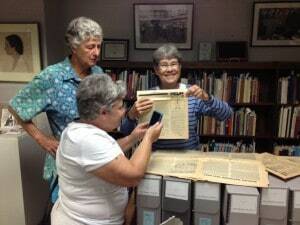 Five women who were active in the feminist community in Iowa City in the 1970s and were early supporters of the Emma Goldman Clinic for Women visited the archives. 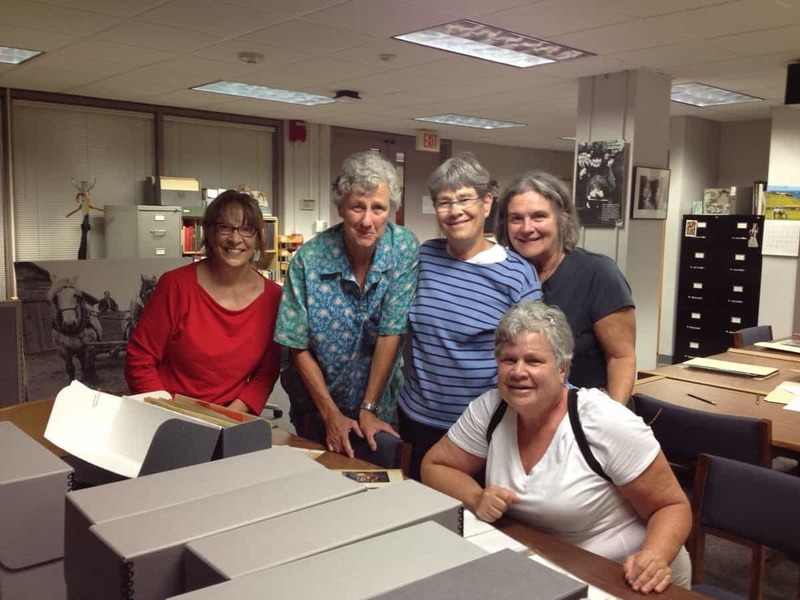 Dale McCormick, Sondra Smith, Gayle Sand, Barb Yates, and Francie Hornstein reunited to look through this feminist health clinic’s records and share memories of its early days. The Emma Goldman Clinic (fondly known as “Emma”) is a not-for-profit healthcare and family planning provider whose records are housed at the Archives. Barb Yates was a “founding mother” of Emma, along with Ginny Blair, Robin Christensen, Melissa Farley, Diane Greene, Darca Nicholson, Deb Nye, Patty Pressley, Carmen Salas, and Roxie Tullis. Barb Yates, Francie Hornstein, and Dale McCormick looking at Ain’t I a Woman, published by the Women’s Liberation Front in Iowa City in the early 1970s. The collections we brought out for our visitors and the stories they shared reflect the rich interconnections among women’s organizations and social justice movements in Iowa City in the 1970s. 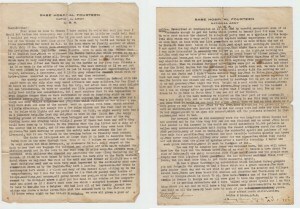 In addition to the material in the Emma Goldman Clinic Records themselves, the history of the clinic is woven through the personal papers of two of the visitors (Dale McCormick and Sondra Smith), as well as other local activists like Jill Jack and Linda Yanney and organizations such as the Women’s Resource and Action Center (WRAC). The women laughed as they told stories about staging a feminist revision of Taming of the Shrew, proudly compared their work on Ain’t I a Woman (the newsletter of the Iowa City Women’s Liberation Front) to the work of women’s groups in New York City in the 1970s, and paused to celebrate the memory of Iowa Women’s Archives co-founder Louise Noun. 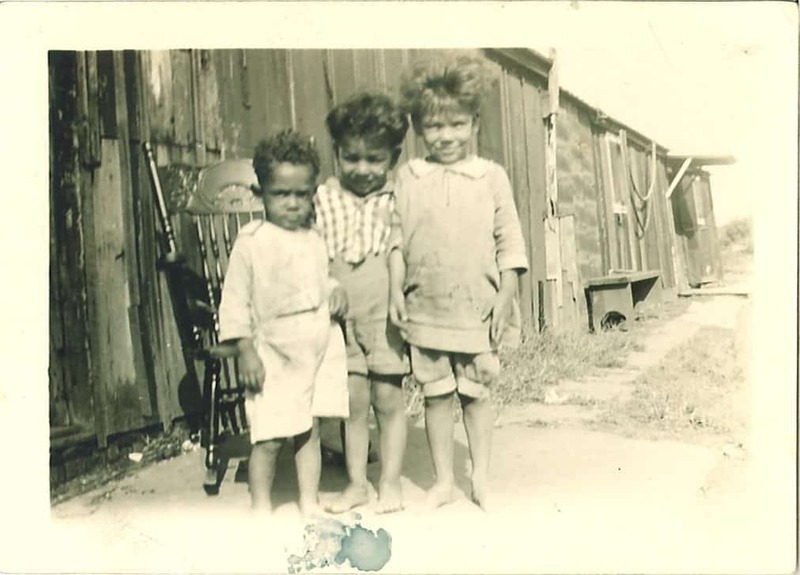 They even found time to help us identify some of the faces in the old photographs. 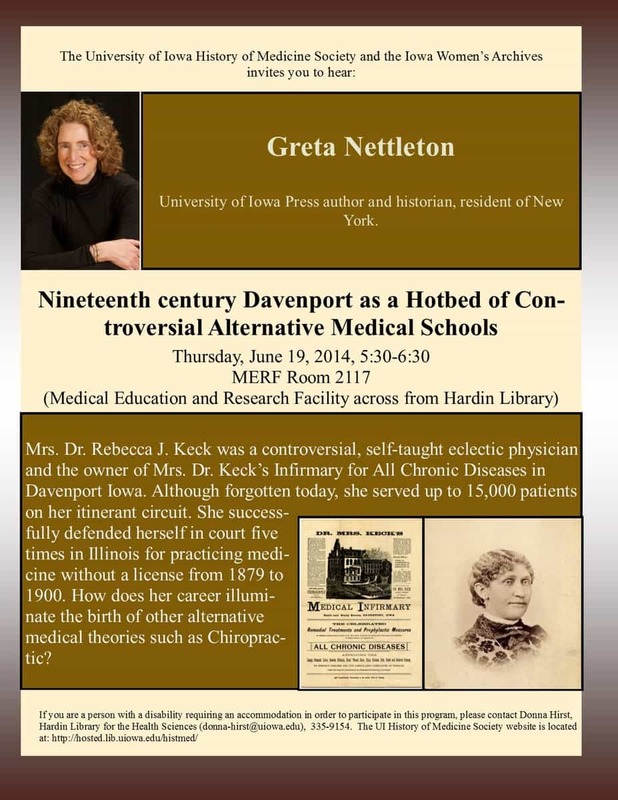 Mrs. Dr. Rebecca J. Keck was a controversial, self-taught eclectic physician and the owner of Mrs. Dr. Keck’s Infirmary for All Chronic Diseases in Davenport, Iowa. Although forgotten today, she served up to 15,000 patients in her itinerant circuit. 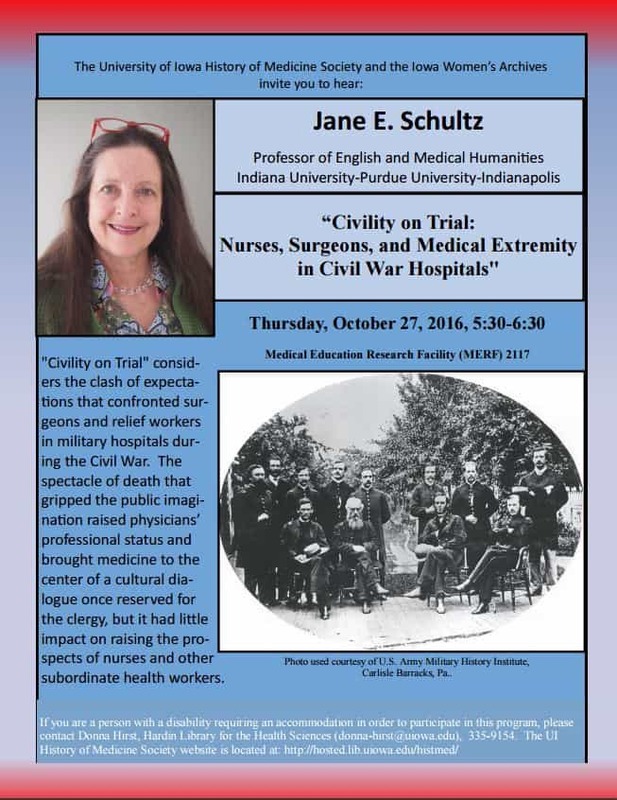 She successfully defended herself in court five times in Illinois for practicing medicine without a license from 1879 to 1900. How does her career illuminate the birth of other alternative medical theories such as Chiropractic? If you are a person with a disability requiring an accommodation in order to participate in this program, please contact Donna Hirst, Hardin Library for the Health Sciences (donna-hirst@uiowa.edu), 335-9154. 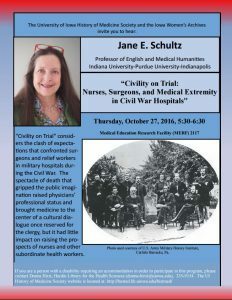 The UI Histort of Medicine Society website is located at http://hosted.lib.uiowa.edu/histmed. 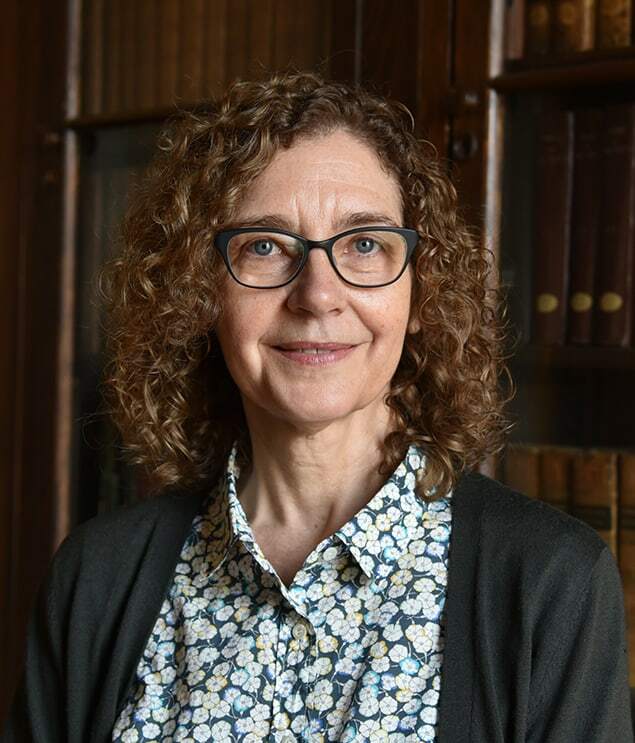 This post was originally written by Jen Wolfe, Digital Scholarship Librarian, for the UI Libraries Digital Research & Publishing Blog. It is re-posted here with minor modifications. University of Iowa faculty, students, and staff discussed a curriculum project that combines historic documents with digital tools and methods as part of the Irving B. Weber Days local history celebration. The one-hour presentation “Archives Alive! : Teaching with WWII Correspondence” took place on Wednesday, May 7 at the Iowa City Public Library. Iowa Women’s Archives Curator Kären Mason provided background on the IWA and its mission to chronicle the history of Iowa women, their families, and their communities by collecting personal papers, organizational records, and oral histories. IWA artifacts on display at the event included a World War II correspondence scrapbook, donated by author and radio personality Evelyn Birkby, upon which the Archives Alive! project was based. Matt Gilchrist and Tom Keegan, Rhetoric faculty and co-directors of the Iowa Digital Engagement and Learning (IDEAL) initiative, spoke about using digital humanities methods to engage undergraduates through hands-on learning and technologically innovative assignments. For Archives Alive!, they developed a four-week curriculum module that required their Rhetoric students to participate in DIY History, the UI Libraries’ transcription crowdsourcing project. After transcribing, researching, and analyzing digitized correspondence from the Birkby scrapbook, students conveyed their findings in a variety of ways; this includes three-minute video screencasts uploaded to YouTube that form a collection of open-access works of original digital scholarship based on primary sources. Archives Alive! panelists Zach Stark, Matt Gilchrist, Tom Keegan, Karen Mason, Jessica Graff, and James Burke, Iowa City Public Library, 2014. Photo by Matt Butler. The event also featured presentations by Rhetoric students James Burke, Jessica Graff, and Zach Stark. For those who couldn’t make it in person, “Archives Alive! 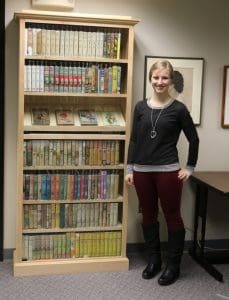 : Teaching with WWII Correspondence” will be archived at the Iowa City Public Library web site. The Archives Alive! spring 2014 student works are available on the IDEAL website, and a letter from Evelyn Birkby to the students is included in the IWA Tumblr post about the project.